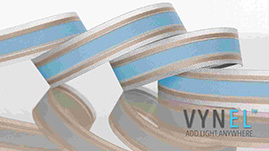 Electric Optics Parallel Electroluminescent Tape includes pieces of Electroluminescent Tape with a 15 degree bend. EL Tape is perfect for tons of applications including Glow in the Dark Tron Costumes, and more. Just peel the backing off the EL Tape and stick on nearly any surface. This product does not come with an inverter, so it will not glow without one. Try pairing with our AA Battery Pack or 9V Battery Pack for a great effect. The Tape Bends and Tape Circles are great for a quick addition to clothing, bags, costumes and more because they come with both a male and female connector which allows you to combine these circles to one another, to lengths of EL Tape or EL Wire, or any of our battery packs or inverters. EL Tape bend glow surface measures : 5.5" x 0.625"
Electric Optics EL Tape is made from premium quality light emitting phosphors (LEP's) which bend around nearly any surface. 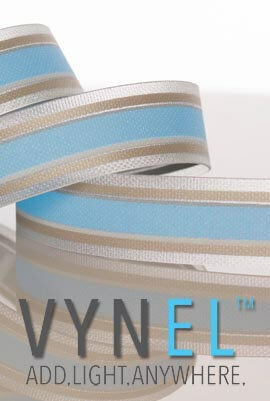 Combined with premium 3MÂ® Tape, we guarantee the highest quality EL Tape available in the market today. EL Tape is currently the most inexpensive, most energy efficient lighting option available anywhere in the world. EL Tape bend glow surface measures : 5.5" x 0.625"